Red Army spotlights the Soviet hockey dynasty both on the ice and off the ice and reveals things we never knew. If you like hockey, you may be interested in watching Red Army. It takes you back to a dynasty in sports history hockey fans will remember well. The film focuses on the glory days of Soviet hockey. It doesn’t focus so much on its first exposure of Soviet hockey prowess back during its early days starting with the 1956 Winter Olympics and continuing in the 1960’s. Its prime focus however was during the 70’s and 80’s when Soviet hockey was at its best and most dominating. This was the era of Vladislav Tretiak who is widely considered to be the best goalie in the history of ice hockey. This was also the era of Vyacheslav ‘Slava’ Fetisov and the magic five that included him, Igor Larionov, Alex Kazatanov, Sergei Makarov and Vladimir Krutov. As Canadians, we saw them as invincible machines who we all thought we’d lose to big time or have to put in a hell of a fight to win, as we did at the 1972 Summit Series and the 1984 Canada Cup. The film also focuses on the team being instrumental during the Cold War. As many may remember, there was the ‘free world’ led by the United States and the Communist world led by the U. S. S. R. or Soviet Union as we commonly called it. Both countries were bitter enemies and both sought to defeat the other. The people were left paralyzed with fear feeling a war between the two might strike any day especially as each country increased its nuclear warheads. As far as sport went, it was in that arena where the Cold War was a common scene of rivalry. The Soviet Union as well as the other Soviet-allied nations of the Eastern Bloc wanted to use sport as a showcase of Communism’s superiority. The USA/USSR rivalry was always the biggest rivalry at any Olympics. The US had their winning sprinters, decathletes, boxers, wrestlers, swimmers and figure skaters. The Soviets had their gymnasts, throwers, weightlifters, cross country skiers, pairs figure skaters and especially its hockey team. The USSR saw their athletes as soldiers in the sports arena. However the film does more than remind us of the times and the USSR’s dominance. It also showed life in the USSR. Life under the rationing system may have been fine before World War II but it was hard after the war especially with the country being devastated at a massive level. It didn’t rebuild well but rationing among its citizen’s still existed. It made for a hard life for most as people lived in crowded houses which might not have included running water. Even Slava Fetisov remembers receiving fish on Thursday. It also showed how the athletes were the privileged ones in the Soviet system while regular citizens had to stand in line-ups for their daily rations. It even showed the weakening of this system to the citizens in the 1980’s which paved the way to the reforms known as Glasnost and Perestroika and the eventual collapse of the USSR in 1991. Of all the hockey players, the film focuses mostly on Slava Fetisov. Fetisov was discovered by sporting scouts of the government who were hired to search out talent at a young age to train up to Olympic level. That was sport in the Soviet Union: children were scouted out, analyzed physically for future athletic potential, and taken to central training facilities to train eleven months a year up to Olympic level. As cruel and inhumane it was for the USSR to do that, it worked and the USSR often had the biggest Olympic medal haul during that time. However the USSR cherished winning in ice hockey the most. In fact there was one propaganda song sung by boys about hockey where they sang lyrics like: “Real men play hockey. Substandard men don’t play hockey.” It was in the hockey stage where they could best show the world Communism’s prowess. It succeeded with winning a massive number of World Championships and eight Olympic golds out of the team’s ten Olympic appearances. 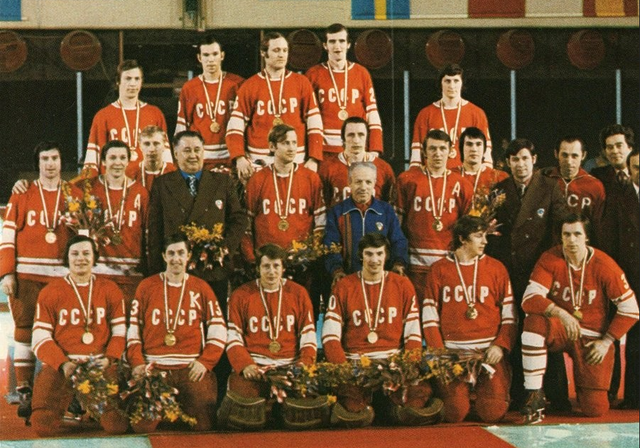 The documentary shows another side of the Soviet hockey team. We all saw the Soviets to play hockey like machines. What we would learn in that documentary is that the Soviets were not only prepared to have the brawn for the game but they were also prepared to have the smarts for the game as they were taught strategies by chess players. They were even taught ballet by some of the top ballet instructors. It wasn’t just tough training they went through but smart training too. What came of it was a play that was not only powerful and effective for winning but a play of style and finesse. Hard to believe none of us Canadians noticed that. Maybe if we weren’t so charmed by all this hockey fighting in the NHL, we would’ve noticed. The documentary showed another aspect of the Soviet players that we missed all along. Sure, we saw the team as machines but the team was like a family. Slava Fetisov, Tretiak, Larionov, Makarov, Krutov, Kazatonov, they all saw each other as brothers. Of course when your taken from your own home and trained at a location thousands of miles away eleven months of the year, it should be natural to do so. It not only helped in making them better players but it helped with the players knowing their playing style inside out and make them a winning combination on the ice. A reminder that team chemistry was as essential to the success to the Soviet team as it is in practically any team sport. That was one of the qualities coach Anatoliy Tarasov— USSR hockey coach from the 1964 to 1972 Olympics– invested into the Soviet hockey team. However the film also shows some darker sides of the Soviet team. It begins however on a positive note with Fetisov’s first experiences being coached by Tarasov in the 70’s. Tarasov wasn’t just simply a strict coach but he also played the role as a father figure to the team. Tarasov also helped develop key qualities in the team–speed, grace, teamwork, and patriotism– that became the blueprint of Soviet hockey and helped create their dynasty. However after Tarasov was fired, Viktor Tikhonov was brought in as coach. The Miracle On Ice game of 1980 really hit the Soviets hard not only as a loss of a gold medal but also what appears to be a turning point for Tikhonov. Tikhonov became a lot more ruthless to the players and trained them harder. You can understand why the Soviet players have a disgusted look on their face whenever you mention the Miracle On Ice game and don’t want to talk about it. It was not only a defeat for them but that also marked the time when Tikhonov became more ruthless. He dominated control over the players’ lives. He even cut players from the Soviet team if he sensed they might defect. One example of Tikhonov’s control was when one player’s father was dying. Tikhonov wouldn’t allow him to see his dying father. Things even got so frustrating for Slava at one point, he ran away from the national team to spend time with Tarasov. Here in the documentary none of the players have a positive thing to say about Tikhonov. The documentary showed that even though the Soviet team was highly acclaimed by the government for their prowess, they were also under heavy scrutiny by the government. Tikhonov wasn’t the only one nervous about possible defections because of the temptation of the NHL. We should remember it was commonly expected that athletes from communist countries were expected to be proud to compete for national glory and reject temptations of money. The team as well as other elite Soviet athletes were allowed to hold Soviet passports: something most Soviet citizens were denied. They were however only allowed to hold them for when they were to attend a competition. Once they arrived back in the USSR, they had to hand them back. Members of the KGB traveled with them in case one member planned to defect. There was a fear that one defection could set off a wave. It reminds us for all their glory and special treatment from the government, they were puppets under a system with a huge eagle eye over them. In fact Tretiak may have been the greatest goalie ever but he was never once allowed to play for the NHL in his whole career. 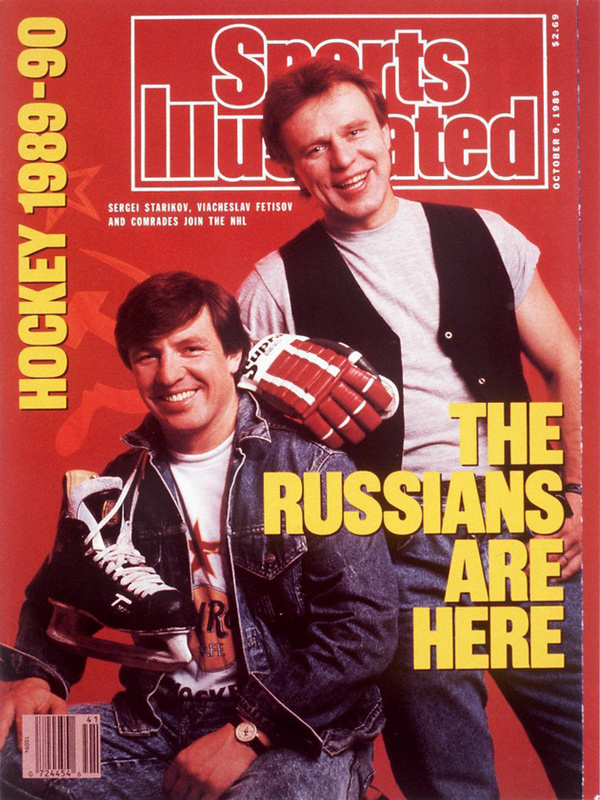 The sudden arrival of Soviet players into the NHL was greeted with excitement but players like Fetisov (right) found adjusting to NHL play came with difficulties. The documentary also shows when the bubble eventually did burst and Soviets eventually did find their way into the NHL. It all started when a junior player by the name of Alexander Mogilny decided to defect in May of 1989. Eight players including Fetisov soon followed. The arrival of such players was met with excitement for some NHL fans while others were more forbidding like Don Cherry who didn’t want any at all. However things weren’t easy. Even though Glasnost and Perestroika were starting to happen, Soviet athletes were still under scrutiny. Fetisov’s professional career in the NHL was monitored. As for play, Fetisov did not adjust too well to new life in the NHL. He learned right in his first game how the NHL was a different kind of play, especially when it came to fighting. His wife Ladlena had some challenges fitting in with the other wives of her husband’s NHL teammates. The struggle was common for a lot of Soviet players trying to adjust to NHL play. Nevertheless things eventually did pay off for Fetisov as he was with the Red Wings in 1997 the same time as Larionov and three other younger Russians. The team was able to get a chemistry of their own and they won the Stanley Cup. The team was able to bring the Stanley Cup to Moscow’s Red Square that year but not without challenges such as clearing things up after a post-victory limousine incident and negotiating with the Russian government. The documentary ends with what has happened since. Fetisov has become a member of the Russian political party, a Minister of Sport in Russia and even part of Russia’s bidding team in 2007 for the Sochi Olympics in 2014. Tretiak is simultaneously the current President of the Russian Ice Hockey Federation and runs his own goalie school in Toronto which is considered physically punishing by most and very restrictive to whom is admitted. Tikhonov was given countless honors like the Orders of Honor and Merit in Russia and was even a nominee for the Olympic Order. The lives of all the hockey players living and deceased are also focused on at the end. However the most notable end is the focus on the end of Soviet hockey. As you know the USSR collapsed in 1991. Surprisingly Tikhonov mellowed down in his coaching style afterward but it was still successful enough to bring the team of former Soviets under the name The Unified Team their last gold medal in 1992. The Soviet dynasty ended with as much of a bangs as it began with at the 1956 Olympics. Team Russia has been a different story. Russia continues to churn out top talents and top players. However Russia has never won Olympic gold. Silver in 1998 and bronze in 2002 but that’s it. They didn’t even have it together during Sochi when they lost their quarterfinal to Finland. Leaves you wondering when you remember that talk of the Soviet’s team chemistry if that’s what’s missing with the Russian team. The film ends showing Alexander Ovechkin, the current Russian phenomenon, playing a shootout game for a Washington TV station. A bit of trivia: Ovie was just two weeks short of his sixth birthday when the USSR collapsed. As he plays his game for the TV crew, we hear Slava saying something’s missing in Russian hockey. You’re left feeling that same way too. One of the funny things of the documentary is that it will remind a lot of Canadians of the inferiority complex Canadians had to endure with in the 1980’s and maybe even the late 1970’s. Already Canadians were going through an inferiority complex of being made to feel second-fiddle to the Americans ever since the inclusion of cable TV bringing American entertainment into our living rooms. Adding to the feelings of inferiority to Canadians was seeing the Soviets excel in hockey. It was often a case of Olympic rules as the best Canadian players were professionals who were ineligible to compete in the Olympics. The best Soviet players however fit within the Olympic rules and were thus eligible to compete at the Olympics Games while the Canadian team at every Olympics during that era always fielded a diluted version of our very best. The Soviets almost always came on top while the Canadian team always fell short. Even when Canada got out its best pros for the Canada Cup, Canada would still face tough challenges from the Soviets as they were total machines and would almost always dominate over the Canadians. You can understand why Canadians cherish the memory of the victory at the 1972 Summit. You can also understand why the Americans hold the 1980 Miracle On Ice close to their hearts. Being second to the Soviets in what is ‘our game’ bit hard and left us down for a long time. The film also brought back a lot of memories not just of the Soviet team but also how many of us remember the changes of Glasnost and Perestroika that were happening of the late-80’s and early 90’s. It even reminded us of the sports personalities at the time such as Brian Williams, Ron MacLean, Don Cherry, Don Wittman and Al Michaels. It also reminds us of many memorable moments in hockey. In fact it brought back the memories when I remember first hearing of Mogilny’s defection. Who would have thought that would be the beginning of the end? Another unique thing is that it does something that was never done with the North American television stations before. It humanized the Soviet team. It reminded us behind the strong stoic Soviet team, they were human beings that went through a lot of difficulties. They had human heartbreak of their own. One example when Slava was in a car crash in 1985 that killed his 18 year-old brother. He went through a period of his live when e just didn’t want to live. Even Slava’s talk about his frustration with Tikhonov to the point he runs away to Tarasov showed that even these tough, stoic players had a breaking point of their own. To think all us North Americans saw in the Soviets were machines. If there was one glitch in this documentary, it’s that Gabe Polsky sometimes does a bit of playing around with the interviews. In fact I remember seeing at the beginning him trying to ask Slava some questions while he’s on a phone call. It’s no wonder Slava flipped him the tweeter after the second question. We see Polsky do a few other stunts too. It’s a question if it was really worth it. Another glitch is that the film was first released in the middle of 2014 and there was some information either missing or failed to update since. One missing piece of information is Tikhonov’s death in November of 2014. Another piece is of the Sochi Olympics where Fetisov was one of the Olympic flagbearers during the opening ceremony and Tretiak was the final torchbearer along with pairs figure skater Irina Rodnina whom herself is also a three-time Olympic champion and considered the best ever in an event known for Soviet dominance. Red Army is an intriguing documentary that hockey fans will find worth watching. It takes you back to a stellar dynasty and a unique time. It will also show you a side of them you may have missed during their heyday. Okay, many of you may remember my Canucks articles from last year. The reason for it was obvious: our third and possibly best chance to win the Stanley Cup. For those of you who want to read them again or have never read them, here are my articles: Confessions Of A Canucklehead, My Stanley Cup Experience, Stanley Cup Game Seven preview and aftermath. Last year we won the Presidents Trophy. This year we do it again. It wasn’t entirely expected at first because October, the first month of regular season started on a down note with five wins, five losses and one overtime. Many Vancouverites were uncertain if we’d do it again but I reassured many that if the Lions can lose their first five games and then go on to win the Grey Cup, the Canucks still have a chance. The months became better over time as the Canucks would bag more wins and move up higher in the ranks to the point they appeared poised to repeat as Presidents Trophy winners. However it would be a tight April 7th as the Canucks were one of four possible teams to win the Trophy and it took a final game that night. Their toughest rival for the Trophy, the New York Rangers, lost their final game. A win from the St. Louis Blues wasn’t enough to supersede the Canucks in the League standings. A win from the Pittsburgh Penguins meant that an overtime at the least would be what the Canucks would need at the least. It wasn’t like last year where the Canucks had a comfortable lead over the second-place team in the NHL by six wins. Nevertheless the Canucks won against Edmonton 3-0 and they repeated as Trophy winners. I remember the game well as I saw it at my cousin’s place. It was a fun time. It wasn’t just hockey action but the dogfights too. My cousin has two dogs–one that looks like Lassie and a puppy that looks like Toto–and they fought alot duing the games. The fights were even more entertaining than the actual hockey fights! The funny thing is that even after the Canucks won, it wasn’t all over. There was still one last NHL game being played at the time: Los Angeles Kings vs. San Jose Sharks. It was an important one too as the Kings and Sharks were both #7 and #8 in the Western Conference and a loss from either team would make them #8 and thus the Canucks’ first Stanley Cup Playoff rival. The game went into overtime and ended with an overtime goal from the Sharks. The Kings are the Canucks’ first rival en route to the Stanley Cup. Now it’s Playoffs time. It all starts April 11th and Vancouver will face Los Angeles. Vancouver has won two of the four regular season games against LA with one of their losses being an overtime. Vancouver has consistently played better against the Kings at home which is an advantage for this contest. Anyways the sixteen Playoff berths have been decided and the match-ups are set. The whole playoff action begins on April 11th. Lots of fanfare and celebrations to be held. One thing’s for sure that I will not buy a ticket for a Finals game again if the Canucks do happen to make it. The amount I payed for a fourth-class seat at the game was ridiculous and I won’t do that again. So enjoy the playoff action. There may be sixteen cities celebrating now but by June, there will only be one city still smiling. Let’s hope it’s Vancouver this time. VANCOUVER-Three wins on home ice. All of their wins have been very close: 1-0, 3-2 overtime and 1-0. One thing about the wins is that they may not have been big or spectacular but the Canucks knew how to play smart at home in order to make the wins happen. Yes, the wins were mostly conservative but their conservative play would pay off at home. Their losses to Boston have been a lot bigger: 8-1, 4-0 and 5-2. Part of the reason for their losses in Boston have to be with the lack of confidence many would display. It would be noticeable as they would miss many important plays. Also during the Boston games, there was a noticeable weakness in Roberto Luongo as he let in a total of fifteen goals. Whenever he was replaced by Cory Schneider, the Canucks would soon get their confidence back and start playing better hockey. Already two top players: Aaron Rome and Mason Raymond are out. BOSTON-Also three wins on home ice. All three of their wins against the Canucks have been decisive: 8-1, 4-0 and 5-2. The Bruins definitely know how to go all out on them while at home but during the away games, they’re lacking. All three of their losses have been tight games. They’re not as good at scoring in Vancouver and despite having a lot of puck control, they don’t materialize it at Rogers Arena as well as they could. One thing about their big wins is that they’re hoping to use it to intimidate the Canucks en route to winning the Stanley Cup. The big wins didn’t intimidate the Canucks enough as they would win 1-0 on Game 5. Tim Thomas has been an excellent goalie conceding only eight goals in the final. However this would prove to be a weakness as there would be two Canuck wins of 1-0. Plus Boston’s big wins in Game 3 and 4 didn’t succeed in intimidating the Canucks as they would win Game 5 1-0, putting the embarrassments of Game 3 and 4 behind them. Now there’s the overall play. The media are already calling this the ugliest Stanley Cup finals in recent years. It all started in Game 1 with the Burrows Bite. Then in Game 3 came the check from Canuck Aaron Rome to Bruin Nathan Horton. That left Horton hospitalized and out of Finals play. For Rome’s part, he was slapped with a four-game suspension also leaving him out of Finals play. Then came the ‘pumping his tires’ reference from Bruins goalie Tim Thomas to Roberto Luongo that has been well-published. Already the Canucks were labels the most hated team of the Finals by many. Then things took a worse for Boston. Game 6 saw a check to Canuck Mason Raymond which left him hospitalized with a fractured vertebrae. Also many on the web have suspected the Boston ice to be too soft and the Boston referees too ignorant to the Bruins own penalty-worthy misdoings. Already the Finals are memorable for a lot of wrong reasons. With Game 7 just more than a day away, people are already giving out their predictions. There has even been some numerology and trivia bits floating about to hint who will win. Now I’m not one who completely believes in numerology or trivia odds and ends but I have been hearing some interesting facts that may lead to tomorrow’s fates. I heard that a Canadian host city of an Olympic Games would win the Stanley Cup the following year: Montreal hosted in 1976 and won in 1977; Calgary hosted in 1988 and won in 1989: Vancouver hosted last year and it’s just so close. Also in favor of Vancouver, there’s the fact that of the fifteen previous Game 7’s of the finals, all but two have been one in the Game 7 host city. However there’s also one going against Vancouver which I learned of during Game 5’s telecast. Of the previous fifteen Cup Finals that lead to a Game 7, all but four winners of Game 5 would not win the Cup. Whatever the odds and ends, whatever play happened in the previous six Finals games, only tomorrow will decide the 2011 Stanley Cup Winner.. Will Vancouver’s conservative style of playing and winning at home pay off? Or will it take its toll in Game 7? Will Boston’s big wins succeed in intimidating the Canucks for Game 7? Or will it be like in Game 5 in which the Canucks were able to bounce back from humiliation and show the Bruins they weren’t so intimidated? It will all be decided when the puck drops in Rogers Arena tomorrow, Wednesday, June 15 at 5pm Pacific time. May the best team win! 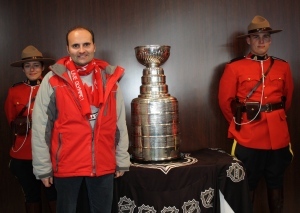 Me with the Stanley Cup. Which team will hoist it tomorrow? So some of you may have already got my first taste of Canucks talk. Well guess what’s happened since? I was at the very first Stanley Cup Finals Game at Rogers Arena! Don’t ask me how much my tickets were. The most I’ll say was they were over $500. I will say that I was glad to be in the arena for a once-in-a-lifetime event. Looking back, I can say I was there when it all started. Tickets for the Finals games didn’t go on sale until 10am on Tuesday, May 31st,, only the morning before Game 1. They were originally intended to go on sale Monday at noon but they were delayed 22 hours for inexplicable reasons. I took an early lunch break at that time to buy a fair-priced ticket for Game 1 from Ticketmaster. By the time I got on, they were either impossible to buy or completely sold out. I know that before ticket-buying I promised myself that $500 was the most I’d attempt to spend on a Stanley Cup ticket, but desperate times call for desperate measures. I called ShowTimeTickets to place an order because I had trouble logging in to their website. Luckily, I was able to buy one ticket for Game 1, for up on the balcony. Unluckily, I broke my promise to myself. I mean it is history in the making, right? Okay, Game Day. On Wednesday June 1st, I was finally done my job at 4:30. I was told by ShowTime to wait until 3 at the latest to get the best seats in the house for my order. Once my work was done, I took my Canon Rebel camera and bag out of my backpack to make my trek to the ShowTime office. Luckily I get my ticket just a minute as soon as I arrive. Amen! My order was for a balcony seat and I ended up with Section 329, Row 13, Seat 107. Original ticket price, $150. Luv-lee! I immediately head to the nearest path to get to Rogers Arena. I get to one entrance and security demands that they check my camera bag and backpack and removed all my empty liquid bottles. Real fun. Then my ticket was taken and scanned. Easiest part of getting in. First thing’s first, I find my seat. Okay, first thing’s not first. I go to get a medium soda and huge pretzel. Yes, my favorite game snack is the huge pretzel! I get my goodies and then head to my seat. I find there’s no finals towel there. Which means either arena personnel forgot to put one on or the guys in the seats above me stole it as an extra thing to hock on Ebay. I set my bags underneath my chair and have my camera around my neck. Nice SLR camera I bought for the Olympics for the sake of taking some good action shots. Now ready for another set of action shots. Before the game began, there was a rap from rapper Kyprios—whom I personally don’t care for—who rapped “How The West Was One”. Game begins with the Bruins and the Canucks on the ice. The national anthems are sung. Meanwhile Luongo is warming up the whole time. Anyways the game starts off on an exciting note. During the first two minutes, the Canucks produced four shots on goal. Boston would respond strongly. First penalty of the game would go to Daniel Sedin and that landed him 4 minutes in the box. Despite more shots on goal, Boston failed to score. The second half of the first period saw more Canucks dominance with a powerplay and six shots on goal compared to Boston’s four. After the twenty minutes were up, the period was scoreless. One thing I have to say is that being so far up in my seat made it hard to notice the Burrows Bite at the very end. It looked like a typical hockey squabble from where I was sitting and I wouldn’t know until tomorrow’s news what exactly happened. During intermission, I left my seat and learned some yahoo spilled beer on my backpack. As annoyed as I was, I should have expected it. Anyways I made a full circle around the lobby to check out the shops, concessions, exhibits and fandemonioum. During the break, I bought another pretzel, this time salted. I took photos of the exhibits and some of the more colorful fans: both Canucks and even a Bruin or two. I hope those Boston fans inside know that Vancouver has a store that sells all sorts of ‘different’ meats, including bear meat! I bought some souvenirs in time for Father’s Day. Oh yeah, Supertramp and Michael J. Fox were spectators that night and Don Cherry was there too. Before I get into my talk about second period, I have to say that being up there in my seat was not an easy thing. I wanted to watch the game and take pictures at the same time. It was not an easy thing to do being from my seat and sometimes using my camera as binoculars for the game. Sometimes I’d forget to take pictures of some of the highlights. I must admit that watching is easier without the camera. I arrive back into my seat minutes after second period began. By the time I arrived, Boston had four more shots on goal and the Canucks had a power play. I returned around the time an injured Dan Hamhuis delivered one of the more entertaining tackles by flipping Bruin Milan Lucic. After that, there was some boring play for a while and then came the penalties- three in a minute. Thanks to a Bruin getting a penalty, I get my first look at the green men. Vancouver loves them but I bet every other team hates them! Vancouver soon came on strong and then Boston had more goal attempts. Nevertheless, the period ended with the game still scoreless. I didn’t want to deal with a soaked bag again so I remained in my seat during intermission. Third period came with the Canucks coming on stronger but Boston continuing to challenge. There was music mixing from DJs Marlon J English and Jay Swing and the Canucks band played in our area. The last half of the third period saw the Canucks come out of their shell and start making more of a serious attempt to score. However in the final minute, most of us were groaning about a possible overtime after a scoreless game. Then the miracle happened. With 18.5 seconds to go, Raffi Torres delivered the goal, much to the euphoria of the full venue. It was there and then we knew the Canucks did it! Even though Boston called a time-out, we knew there was no hope for them. The game was ours and the Canucks began their quest for the Cup with a Win and Torres was the savior of the night. 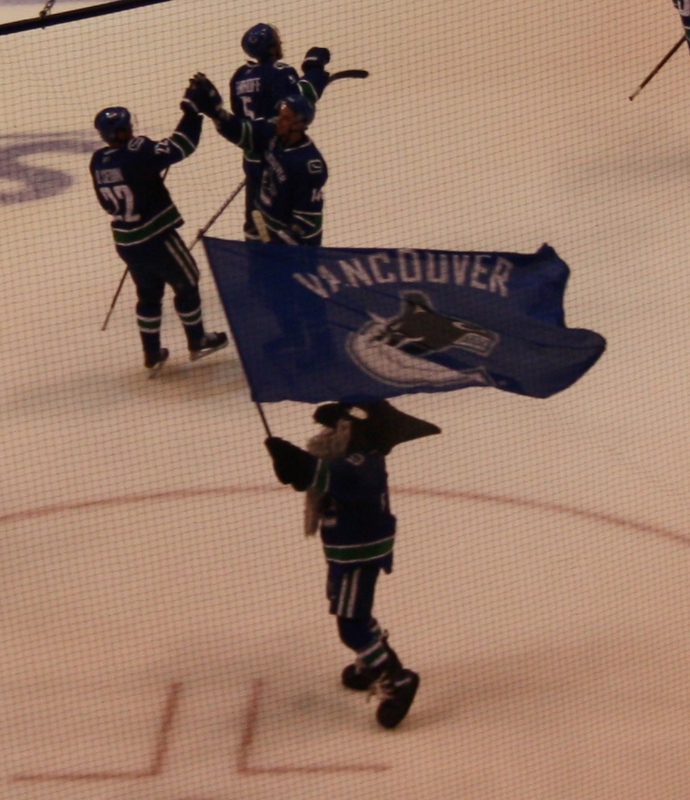 The final mark of the win was Fin waving the Canucks flag on top of his hockey stick. After the win, it was a party as people were leaving the Rogers Arena and into the streets of Vancouver. As I exited arena with my backpack soaked in beer, the streets were loaded with fans. I met one guy who came from Winnipeg to see this. For three blocks until I hit the Central Library, it was like a complete parade of fans. Even after I left the library ½ hour later, it was still active with fans. Already the quest for the Cup began with a good start. Hard to believe it was five days ago. Hard to believe Game 3, Boston’s first Finals game as host happened tonight. We had a second game on Saturday where the Canucks started good but Boston pulled a second period surprise. I was with friends in a church hall at the time. I kept on telling them ‘It’s not over.’ In the third period was the game-tyer. However with an event taking place upstairs, the church was under a strict regulation to end telecast of the game at regulation, overtime or no overtime. When we made it to the chapel, we were reassured that the Canucks won: 11 seconds into overtime by Burrows. All I can say this last while is fan euphoria like no other. There have even been fan videos from Youtube. My favorite is of a Victoria comedian imitating a Bruins fan with Boston accent, attitude, foul mouth and all. I think he could rival the green men. Just now, Vancouverites are recovering from an 8-1 loss to Boston. I was working when it all happened but I heard a lot and saw enough from replays on Youtube. Canuck Aaron Rome has gotten the biggest heck for that check to Nathan Horton that left Horton carried off on a stretcher. Boston sure came back with a vengeance, although many Canuck fans are complaining about bad reffing. Bad reffing or not, the Bruins won the game. Personally I had a bad feeling that Boston would win today but not by that much. I knew that both Canucks wins came from very tight games. Game One was won by a goal in the last minute. Game 2 was won by an overtime goal after just eleven seconds. Before Game 3, Boston was able to show the Canucks that they can be a formidable rival, even though they lost both games. Boston knows the Canucks are a tough team but they also have a vulnerable side and they really exploited that tonight. Many Canuck fans are claiming they appeared tired after the second and that’s where it all went Boston’s way. Now the Canucks know they will have to play harder smarter games if they don’t want to give anything else up. I believe the next Boston game will be another nail biter for both teams. Nevertheless Vancouver can take comfort that they still lead the finals two games to one. It ain’t over yet. I don’t think I’ll ever see another Stanley Cup Finals game ever again. Not that I doubt the Canucks in the future but I believe the next Stanley Cup Finals tickets will be way more expensive the next time. It’s even possible that in the near future, $1000 won’t even be enough. All I can say is I was glad to be there when it all started. Now I have something to tell my grandkids! Okay. Now’s when I take a break from my journalistic ambitions and I write about something on my mind. Normally during most of the year, I don’t pay attention to hockey that often until playoff time. 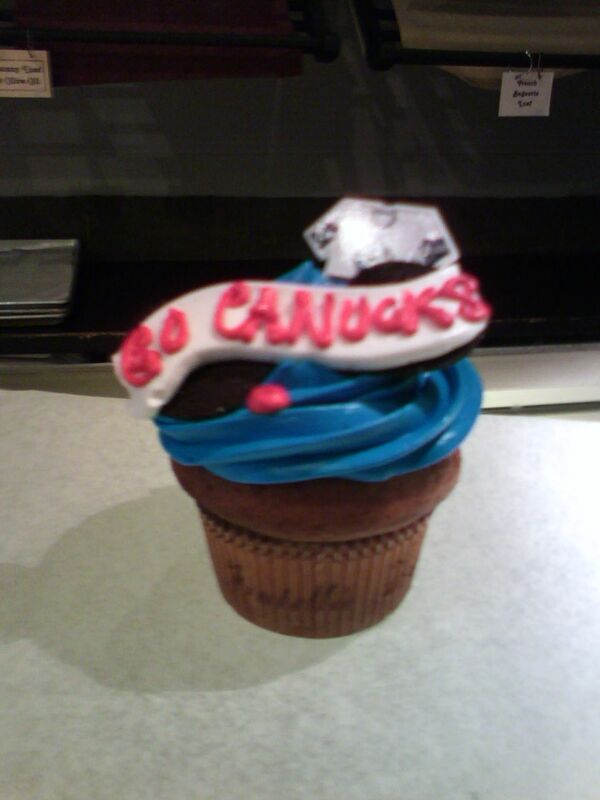 Then, like most Vancouverites, it’s my focus on how far they make it through the playoffs to the Cup. This year was a landmark year for the Vancouver Canucks. For years, Vancouverites have been hoping they’d win the Stanley Cup and this looks like the first year they might do it. They’ve made it to the Stanley Cup finals before–in 1982 and 1994–but they’d lose both times. The latter was especially famous for the rioting that happened for days. Since then, Vancouver has had a reputation of being the unofficial riot capital of North America. Since the 1994 Stanley Cup, Vancouverites have been hoping their Canucks would have another shot at the Cup. The time since the 1994 Stanley Cup to the 2004 NHL Lockout were not the best of times for the Canucks. Despite a new arena with the GM Place, now called Rogers Arena, it had some difficulties including four years in a row failing to make the playoffs. Whenever it did qualify, they would only get as far as a Conference Quarterfinals of Semifinals. After the 2004 Lockout, the Canucks have had a change for the better. Upon returning to NHL play, they didn’t qualify for the 2006 or 2008 playoffs. 2007, 2009 and 2010 would see them win the Northwest Division but only make it as far as the Conference Semifinals. one bright note was that Roberto Luongo was named Goalie Of The Year by the NHL for two years straight. The 2010-2011 was a different year for the Canucks. After the usual trades and free agent deals, the Canucks were ready to start their new year, which was also their 40th Annivarsary, with a bang. After losing their first game against the Los Angeles Kings 2-1, the rest of the season was complete magic.With 54 wins and 19 losses, including scoring 262 total goals and conceding only 185, the Canucks were the top team of the NHL in regular season. Upon having the top standings in regular season, they were awarded the President’s Trophy. When the playoffs began, their first round pairing was against none other than the defending Stanley Cup champions the Chicago Black Hawks. The first three games were wins against the Hawks and appeared to have a comfortable lead over them. Things sure changed once the fourth game began. The Hawks showed that even though they entered the playoffs the last of the Western Conference teams to qualify, they were not going to give up their Stanley Cup chances easily, and boy did they pour it on once the fourth game started. The Hawks came back with 7-2, 5-0 and 4-3 overtime wins. That left the seventh and last game a nailbiter. Played at Rogers Arena on Tuesday April 26, the Canucks appeared poised to win with 1-0 until Hawk Jonathan Toews scored the game-tier with 2 minutes to go. This left fans nervous as the game went into overtime. It took a goal from Alexandre Burrows at 5:22 to win it for the Canucks and move them to the next round. It’s a good thing too because the previous two Presidents Trophy winners lost in the Conference quarterfinals. If the Canucks did the same, three-in-a-row would make the Presidents Trophy a curse! After the Conference quarterfinals, things were easier for the Canucks although they still had to put in a good fight. The conference semis against the Nashville Predators was also a tight competition but the Canucks prevailed four games to two. The Conference Finals against the San Jose Sharks were possibly the easiest of the bunch. The Canucks won four games to one and the Canucks wins were in spectacular fashion. They’re the first Canadian NHL team in four years to qualify for the Stanley Cup finals. For the record, the last Canadian team to win the Stanley Cup was Montreal in 1993. Will the Canucks break Canada’s 18-year drought? CANUCKS-What haven’t I talked about already. A team loaded with talent, but all coming down to how they play as a team unit, and under the pressure of the Stanley Cup. They showed they could lead well but almost give it up, as they did against Chicago. They also showed they can come on strong as they did against the Sharks. It all depends how they play against the Bruins. One thing about the Presidents Trophy winner is that those winners that qualify for the Stanley Cup final have the odds with them. Of the nine previous Presidents Trophy winners that made it to the Cup Finals, seven won. Will the Canucks be the eighth to do so or the third to lose? BRUINS-They finished third in the Eastern Conference and won the Northeast Division. Like the Canucks, they had a tough fight in their Conference Quarterfinals against the Montreal Canadiens and qualified for the semis on a seventh game overtime goal. Their Semis against the Philadelphia Flyers were magic as they won four straight games en route to their Conference Finals against the Tampa Bay Lightning. Their Conference Finals against the Lightning was a tougher affair as Tampa Bay proved to be a tough opponent. In the end, the Bruins won their seventh and final game with a single goal by Nathan Horton with 7 1/2 minutes to go in the third period. That’s all it takes! One important fact: In their one regular season game against the Canucks, they won 3-1. Even the Canucks will admit that they are a good rival. The Bruins had one of the highest goals-per-game averages in regular season this year. The defence of the Bruins is so good, even Luongo will admit it’s their strongest asset. However in playoffs, their scoring magic has taken a backseat. They’ll have to pour it on against the Canucks featuring Luongo if they want to win their sixth Stanley Cup. Anyways on with the show. Hopefully the Canucks will win their first ever Stanley Cup. What’s especially noteworthy is that I promised my Admin team at work that if we win the Cup, I will buy them all a cake! I’ve already bought cupcakes for them when we won the Conference quarterfinals. Make it a yummy win guys!